Last Sunday saw England women’s all-rounder and Surrey CCC star Natalie Sciver visit the latest showcase ECB Club Open Day with Waitrose event at Thursley Cricket Club, raising awareness of visually impaired cricket. 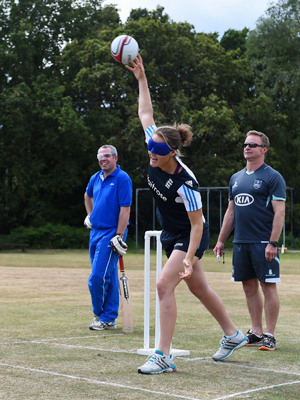 A Surrey Visually Impaired CCC side took on an I’anson League Representative XI who wore simulation glasses and blindfolds, with Sciver given the honour of bowling the first ball of the match. During the tea interval, with refreshments provided by Waitrose, a kids coaching cricket taster session for both the visually impaired and newcomers to the game was also on offer. Funds were raised for two local charities, Sight for Surrey and Phyllis Tuckwell Hospice. Commenting on the event, Natalie Sciver said: “I’ve been lucky to go to a few clubs recently and the enthusiasm you see for the game is inspiring. Being able to partake in the visually impaired game was a new experience for me but lots of fun, despite being slogged around the park! It’s brilliant that clubs like Thursley can bring the community together for charity with friends and family enjoying the game. Building on the successful launch of the initiative last year, this season has seen over 850 clubs register to host an ECB Club Open Day, with events running nationwide on England’s international cricket weekends. Supported by Waitrose, who are giving a £100 food voucher to the first 1000 clubs who register, the Club Open Days are designed to boost cricket participation by encouraging clubs to open their pavilion doors and invite local people to find what they have to offer. Waitrose have further committed to developing the grassroots game by confirming that they will donate £100 to the ECB Charitable Trust for every four or six scored across the entire international summer. This includes every England men’s, England women’s, England Lions, England under-19s and England disability match, with resultant funds (estimated to amount to around £150k) being made available for cricket clubs to apply for a special grant from. List of club open-days supported by Waitrose registered so far.